Her Royal Highness Princess Maha Chakri Sirindhorn was born Her Royal Highness Princess Sirindhorn Debaratanasuda on 2 April 1955 to His Majesty King Bhumibol Adulyadej, King Rama IX, and Her Majesty Queen Sirikit of Thailand. 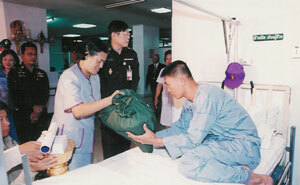 Her Royal Highness Princess Maha Chakri Sirindhorn has rendered public service continously since her early youth. 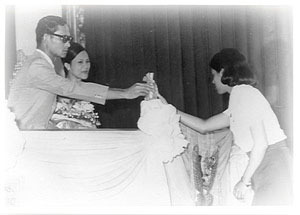 Due to her work dedication, on the occasion of the 50th Birthday of His Majesty the King, 5 December 1977, His Majesty the King conferred the Royal title of Somdech Phra Debaratanarajasuda Chao Fa Maha Chakri Sirindhorn Rathasimagunakornpiyajat Sayamboromrajakumari upon her. 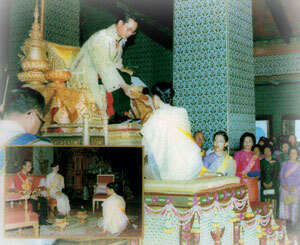 Upon being acknowledged of her distinguished service to the nation and to humanity worldwide, His Majesty the King has graciously conferred the Orders of the Kingdom of Thailand upon Her Royal Highness Princess Maha Chakri Sirindhorn, who has also received the Orders of Other Nations which were conferred upon her in recognition of her significant contribution to relations between nations. 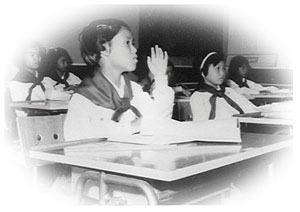 Her Royal Highness Princess Maha Chakri Sirindhorn began her schooling when she was three years old, she joined kindergarten with other classmates at Chitralada School in Dusit Palace, the private school founded by His Majesty the King where all royal children were not treated differently from any other students. From the very beginning of her education, Her Royal Highness developed her scholarly ability, showing aptitude for learning which substantiated her consistent academic progress. Adopting the habit of reading from Their Majesties the King and Queen and being guided by her own nature to explore and seek knowledge, she becomes passionately interested in reading and studying Thai and foreign literature. Around the age of twelve, Her Royal Highness started writing proses and poetry. Not only was she keen on academic subjects, she also enjoyed school activities such as sports, music, school fairs and social events. After completing high school education in 1972, being ranked number one in National School Examination, Her Royal Highness Princess Maha Chakri Sirindhorn enrolled in Faculty of Arts, Chulalongkorn University, with focus on history, Thai and oriental languages. Although Her Royal Highness often had to accompany Their Majesties the King and Queen on royal up-country visits, she has put more effort into her study and class assignments. In addition, she regarded the university experiences as invaluable for it gave her knowledge while at the same time provided her great opportunity to get to know people from all walks of life. Her Royal Highness also enjoyed extra-curricular activities on campus just the same as other college students, i.e. "Welcome Freshmen" Party, faculty sports day and cleaning day. She graduated with a Bachelor of Arts Degree, first class honour, gold medal in History in 1976. 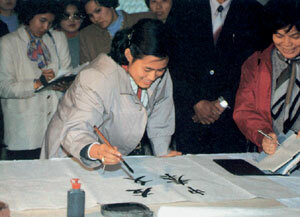 Her Royal Highness Princess Maha Chakri Sirindhorn continued her studies in two Master's programmes concurrently, obtaining Master of Arts in Oriental Epigraphy (Sanskrit and Cambodian) from Silpakorn University in 1978, and Master of Arts in Pali and Sanskrit from Chulalongkorn University in 1980. 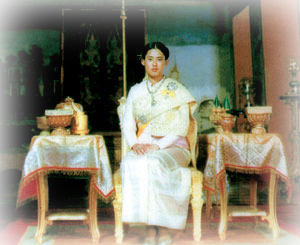 Her Royal Highness continued her studies for a doctorate with a slightly shifted focus of interest from arts and humanities to social sciences and education, she enrolled in a Doctor of Education programme in Development Education, an inter-disciplinary degree for her professional development at Srinakarinwirot University (former College of Education) in 1981 and graduated in 1987. The principle of using education as a means of community and social development which Her Royal Highness has acquired during her doctoral studies, together with her former experiences in the field, has served as a solid base for her subsequent involvement in community development activities ever since. In addition to her formal education, Her Royal Highness Princess Maha Chakri Sirindhorn continued to pursue life-long learning by attending several training courses and workshops to enhance her knowledge and skills in effective integrated development. These subjects include computer, cartography, meteorology, survey and photogrammetry, remote sensing and geographic information system and nutrition. In her own wide-ranging academic pursuits, Her Royal Highness has ensured what she has learned can benefit the people with whom she works. 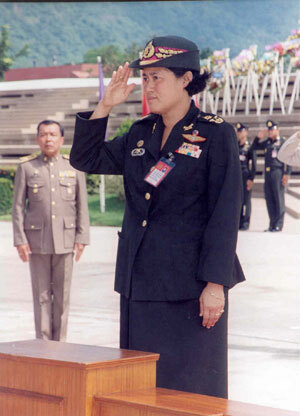 Her Royal Highness Princess Maha Chakri Sirindhorn started her academic career teaching history at Chulachomklao Royal Military Academy (CRMA) in 1980. From the starting point as a lecturer in the Department of Law and Social Sciences in the Academic Division of CRMA, Her Royal Highness had duties and responsibilities just the same as other CRMA' s personnels. The Department of History was formally established in 1987 and Her Royal Highness has become the Director of the Department until now. In 1996, Her Royal Highness was promoted to the highest military rank "General", and following in 2000, was granted the professional title as "Professor" due to her insights and knowledge. Some listings of her taught courses are Thai Studies, Thai History, South East Asian History, Eastern Asia History and Contemporary World History. She occasionally gives special lectures at several other institutions such as Chulalongkorn University, Thammasat University, Chiangmai University and Silpakorn University. She also regularly attends academic conferences and seminars both in and outside the country. In addition to the teaching career in CRMA, Her Royal Highness Princess Maha Chakri Sirindhorn has many different duties to perform every day. 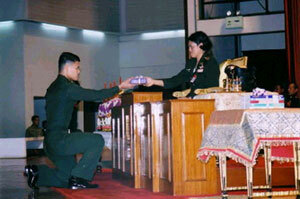 Some are familiar public duties, such as ceremonies, receptions or visits within Thailand or abroad. Besides, Her Royal Highness carries out official duties and public engagements as her Royal Dutiesfor the benefit of the Thai people. She also represents Their Majesties in various royal functions and performs The Royal Duties Assigned by Their Majesties the King and Queen especially the duties in overseeing the management of philanthropic organizations and foundations. Since 1977, she has been the Executive Vice President of the Thai Red Cross Society ; and the Executive Chairman of several foundations including the Chaipattana Foundation (in charge of His Majesty the King's development and environmental conservation projects), the Anandha Mahidol Foundation (to promote higher education), and the King Rama II Foundation (to conserve and promote Thai culture). She is also the President of the Prince Mahidol Award Foundation (to provide international recognition to individuals who have made outstanding contributions in the fields of medicine and public health). 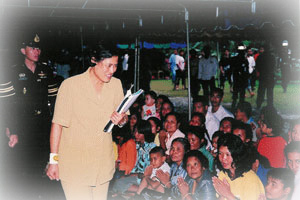 Imbued with a sense of responsibity and caring, Her Royal Highness Princess Maha Chakri Sirindhorn went on to foster several significant initiatives : providing basic education for school children in remote border areas, promoting plant genetic preservation and gene bank projects, instituting IT efforts to assist the handicapped to achieve independent living, and developing nutritional campaigns to improve the well-being of Thai people. Some of these projects, begun more than three decades ago when she was in her twenties, continue to this day. 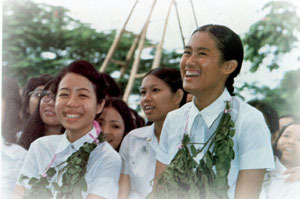 Since 1990, Her Royal Highness has led cooperation programmes in the Lao People's Democratic Republic, following by the development for post-primary education in the Kingdom of Cambodia, and presently, her initiatives extend to more cooperation in many countries such as educational and academic cooperation with the People's Republic of China, royal scholarships for students in the People's Republic of China and Tibet, to name a few. Among all her initiatives implemented, most of them are well funded and managed. Moreover, she is not a distant benefactor, her consistent visits to the project sites to monitor their progress help her gather the latest information and assess programme developments. Her Royal Highness Princess Maha Chakri Sirindhorn has inspired those who have followed her life and work to be a part of this charitable deed. Many people, companies, associations and organizations, including those from foreign countries, continuously present her with money or essential resources for implementing her initiatives. Hence, Her Royal Highness founded the H.R.H. Princess Maha Chakri Sirindhorn Charity Fund with aims to support projects that improve people's life condition including programmes that relieve those suffering from catastrophe. 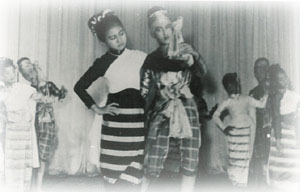 Modern living and hi-technology gadgets have drawn the young generation away from Thai traditional culture progressively. Fortunately, Her Royal Highness Princess Maha Chakri Sirindhorn has expressed her concern in saving and reviving valued Thai traditions. With an intensive effort to preserve Thai art and cultural heritage, Her Royal Highness has conducted many activities including reconstructing monuments and preserving antiques, supervising the restoration of national treasures and promoting Thai classical music. Her accomplishments have been acclaimed by many universities, both local and international, through their bestowal of Honorary Doctoratesin several disciplines upon her. In addition, Her Royal Highness' dedication is also acknowledged worldwide, she therefore was granted Honorary Awardsand Honorary Titlesfrom many institutions and organizations. Thai people have acknowledged Her Royal Highness Princess Maha Chakri Sirindhorn's longstanding efforts to help people in distress and her unselfish service to humanity, regardless of socio-economic status, creed, race or nationality. 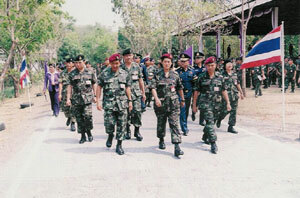 Her achievements have not only been known among the Thai people, but also people from around the world. In honour of their beloved Princess, many individuals, associations, foundations and organizations have proposed their requests for Her Royal Highness' royal title and her naming for the new species of plants and animals including places and many others. One of her active role is patronage of many humanitarian charities, philanthropic foundations and organizations which were founded by her initiatives or for public service. In her spare time, Her Royal Highness Princess Maha Chakri Sirindhorn enjoys various leisure activities. One of her favourite pastimes is reading which includes her interests in going shopping for books and collecting books in her personal libraries. Her love of reading leads to her talent in writing articles, poetry, short stories and travel books. Proceeds from her written accounts of her oversea travels are the main source of income of the Princess Maha Chakri Sirindhorn Foundation which was set up in 1979 to support needy students in schools, vocational colleges and universities. 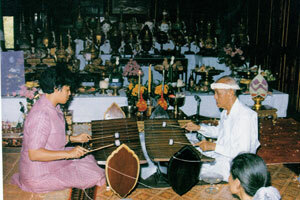 Her Royal Highness Princess Maha Chakri Sirindhorn enjoys playing Thai classical instruments and practising Thai classical dancing. She sometimes paints. She is also keen on sports : jogging, swimming, biking and trekking, which give her an opportunity to learn about plants, trees and geographical features of the areas. In addition to her knowledge of Pali, Sanskrit and Cambodian, Her Royal Highness is communicative in both English and French and has been learning Chinese, German and Latin.